Premier Li Keqiang presided over a symposium during his inspection tour of the Ministry of Finance and the State Taxation Administration. According to the Report on the Work of the Government released earlier this month, larger-scale tax cuts call for urgent implementation. Premier Li, for the purpose of following up with the current situation of tax reduction, inspected the work of the Ministry of Finance and the State Taxation Administration. At the Ministry of Finance, the Premier inquired about the preparations for lowering VAT rates on April 1. At the Taxation Department, Premier Li pressed staff members to keep track of the fluctuating tax burdens for all industries, improve pre-arranged planning in line with actual circumstances, reduce tax burdens for the manufacturing industry, and alleviate tax burdens for the service industry, in a bid to boost consumption growth and improve people’s well-being. Tax burdens for enterprises should be largely reduced, with their sense of gain substantially increasing, facilitating the drivers of China’s economic development, said the Premier. At the office of tax cuts and fee reduction of the State Taxation Administration, the Premier praised the systematic talent selection and schedule-based implementation of tax cuts. The monitoring platform based on big data, the Premier said, should come into full play, with real-life effects of tax reduction under stringent supervision. Premier Li spoke with grassroots staff members across the country via video chats. Work concerning the special fee deduction on children’s education and elderly care should be stepped up, with larger-scale VAT cuts forging ahead. With only 10 days left before the official implementation of larger-scale tax cuts, the Premier pressed the State Taxation Administration to steer progress of the tax cuts campaign as a whole and fully benefit market entities. Referring to the reports from the Ministry of Finance and the State Taxation Administration at the symposium, Premier Li said that the larger-scale tax cuts should spearhead significant reform measures as well as macroscopic readjustment and control against the backdrop of economic downward pressures. The larger-scale tax cuts are to be productive and conducive in the long run. They will not only help relieve burdens for enterprises and boost employment, but also facilitate optimization of the economic and income distribution structure. Additionally, larger-scale tax reduction will come as a great help for tax source cultivation and sustainable financial development. 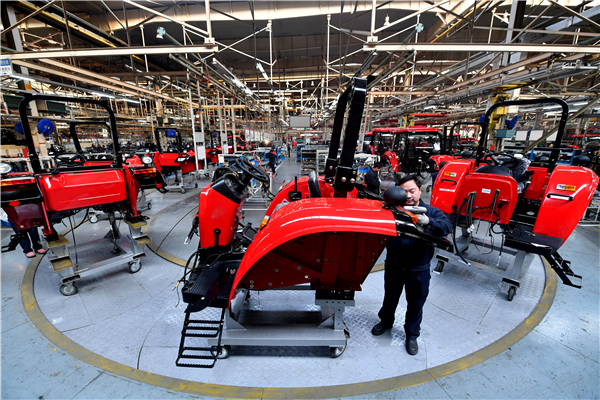 In so doing, tax cuts should be made to bring out the vitality of the enterprises, in a bid to keep the economy operating within a reasonable range with high-quality development, the Premier said. Industries should enjoy tax cuts across the board. And major industries, featuring the manufacturing sector, should see obvious relief in tax burdens. As for potential tax burden increases in certain industries, as a result of a decrease in input tax deductions, the departments concerned should formulate targeted solutions based on experience drawn from the past. In order to fully implement this round of tax cuts, the government must live on a tight budget. Apart from key projects and programs, the central fiscal authority will reduce its expenditures by 10 percent, Premier Li said. Local governments, the Premier added, should also resolve to cut their general expenditures and improve the efficiency of existing resources. In terms of whether this round of tax cuts are effective, the final say is with the market entities. All regions and government departments should beef up coordination to cope with the issues reported by companies and the people in a timely manner. Vice-Premier Han Zheng and State Councilor Xiao Jie also attended the symposium.